Telluride Outside has been the region's premier guide service since 1984. Our fly shop, Telluride Angler, was founded in 1994. We carry the finest brands, including Scott, Sage, Ross, Abel, Simms, Patagonia, Scientific Anglers and Ex Officio, but what truly distinguishes our company is quality staff and our commitment to service. CLICK HERE to watch our collection of Fly Fishing Instructional Videos. CLICK HERE to jump straight to our Reservation Inquiry Form. Our staff and guides have fly fished all over the world, but many of us learned to fly fish right here in Telluride. Our mission is to teach techniques, share experiences, and help our customers enjoy this wonderful sport. The San Miguel, Dolores, Uncompahgre and Gunnison are among the finest trout streams in the Rocky Mountains. Each offers unique fly fishing opportunities, from the San Miguel's freestone pocketwater to the glassy runs of the Lower Dolores. Lakes, ponds and alpine creeks offer even more choices. The quality of our fly fishing is matched only by the beauty of our surroundings. Telluride is an angler's paradise. We began guiding the area in 1984 and have assembled a spectacular menu of public and private flyfishing water, including private leases on each river. Prices include flies on all trips and lunch on full day trips. Please review our "Private Water Menu," below, for additional destination choices. Private water locations cost an additional $100-$150 per rod. Top quality rental equipment is available for guests who need gear. The San Miguel is one of the friendliest trout streams in the Rockies. Our "backyard" river, the San Miguel holds enormous appeal to anglers of every ability. 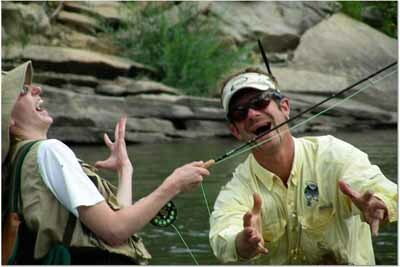 Beginners enjoy short casting to unselective trout in the San Miguel's high-gradient pocket water. Experts enjoy the challenge of fishing a highly structured stream that rewards clever casts and drag-free presentations. The San Miguel's abundant trout fight incredibly hard in the river's fast currents. Their food source is plentiful. The San Miguel hosts more than six species of stoneflies which hatch from February through September each year, along with a gigantic population of caddisflies. Many anglers place the San Miguel with the Roaring Fork and Arkansas as one of the great caddis rivers in the West. Pale Morning Dun Mayflies, Blue Winged Olives, plenty of midges and terrestrials round out a bountiful menu for San Miguel trout. Trout average approximately 12" in the San Miguel, with fish commonly caught up to 18+". Even the largest San Miguel fish are often caught on dry flies. Seasonality: The San Miguel has an excellent "pre-runoff" window from late February through mid-April. Spring skiers should pack a fly rod and plan to spend a day or two on the water. Runoff generally lasts from mid-April through late-June. This varies enormously from year-to-year, because the San Miguel is an undammed stream. 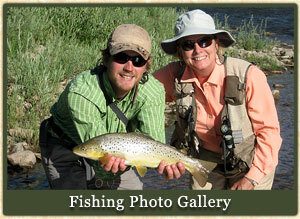 Peak dry fly fishing runs from early July through mid-September. "Dry-dropper" techniques are highly effective during this period and have become the primary method used by our guides. Late September, October and early November can offer excellent nymphing on the San Miguel. The river is low and highly wadeable during the gorgeous fall months. The Uncompahgre is one of the real sleepers in Colorado. We have excellent public access at Pa-Co-Chu-Puk State Park, just eight miles north from Ridgway and less than an hour from Telluride. In addition, our two private leases provide access to secret water that gets very little pressure from other anglers. The Uncompahgre is a dam-controlled river, providing relatively constant flows regardless of weather conditions. This plays a key roll during summer months when rain can wash out area streams. In June, July and August, the Uncompahgre boasts one of the best Pale Morning Dun mayfly hatches in Colorado. Midges, caddis and plenty of terrestrials complete the foodbase. 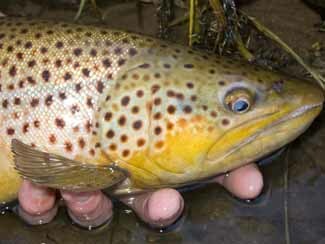 In lower sections of the Uncompahgre, sculpins, stoneflies and other large food items support a healthy brown trout population. 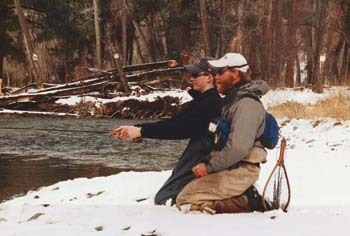 The Uncompahgre is also our best winter fishery, thanks to relatively low elevation (approx. 6,500 feet) and dam controlled tailwater flows. When other rivers freeze over, the Uncompahgre keeps on flowing. In the winter, trout feed primarily upon the abundant midge population, which lends to site-nymphing for fish suspended in relatively shallow water. Hefty trout are caught year-around in the Uncompahgre, with many of the true trophies coming during winter months. The headwaters of the Dolores lie just south from Telluride, near Lizard Head Pass and the Wilson Mountain Range. Variety is the name of the game on the Upper Dolores. Between Lizard Head and the town of the Dolores, the watershed is fed by a dozen cutthroat and brook trout streams descending from alpine basins. The Main Fork and West Fork offer more than 75 miles of trout water. Willing fish and magnificent scenery make the Dolores a Colorado flyfishing classic. The Upper Dolores is a checkerboard of public and private water. The seven miles on the main branch upstream from Rico is mostly public, whereas the 35 miles of water below Rico has only a few public access areas scattered between long stretches of private water. Telluride Outside is proud to offer the best of both public and private water on the Dolores. For descriptions of our private stretches, see the "Lightenburger", "Roaring Fork", and "Line Camp" descriptions, below. The Dolores is a high elevation watershed, with miles of public access above 9,000 feet. Abundant hatches feature caddisflies, several species of stonefly, Pale Morning Duns, Blue Winged Olives, Green Drakes and midges. However, it is the terrestrials, such as grasshoppers, beetles and ants, that distinguish the Dolores from other area rivers. A heavy PMD hatch begins in late June and runs through July. During this period, Upper Dolores fish sometimes become selective feeders. As a rule, however, you can expect great success throwing attractor dry flies and terrestrials from late June through September. Below the McPhee Reservoir, the Dolores winds like a spring creek through a lush, low gradient valley. This is our most challenging dry fly water - a place for advanced anglers to test their skill and nerves. Anglers can expect to face many fly fishing challenges on the Lower Dolores. The McPhee Reservoir, completed in the early 1980's, was constructed to manage water for irrigation. Pinto beans and water-intensive crops such as alfalfa are grown in this arid land, pulling most of the water out of the Lower Dolores. In low water years, fish numbers decline and the trout seem to scatter. Locating fish and carefully stalking them plays a critical role in our approach. When we find fish, it is necessary to make a pinpoint presentation to fool them. 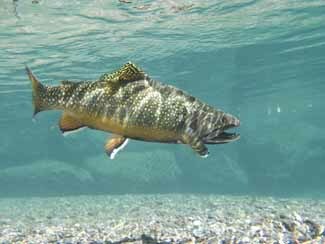 Lower Dolores trout grow to great size and become exceedingly wary in thin, air-clear water. We normally fish with long, light leaders, so playing fish can be a delicate process. Even when throwing grasshoppers, we typically fish leaders over 12 feet in length. Tricky conditions are at least partly balanced by phenomenal insect hatches. The year's first grasshoppers appear in April, followed by beetles and blue winged olives. Caddis appear in early June, with Pale Morning Duns coming on strong near the end of the month. Terrestrials, such as hoppers, ants and beetles, play a major role all the way through October. As the PMDs decline in late July, Mahogany Duns, Blue Winged Olives and midges fill the void. Watch for the amazing orange-winged grasshopper, which materializes in late August most years. Smart fish make stupid mistakes when it's around. Late fall features intermittent midge hatches and blue winged olives that hatch on cloudy days. Telluride Angler offers float fishing trips on the Lower Gunnison River and wade fishing on two sections of the Gunnison (inner Canyon wade fishing is through our friends at Black Canyon Anglers, CO Outfitter #618). The mighty Gunnison is one of Colorado's legendary trout streams, famous for voracious browns and rainbows that can reach two feet in length. We wade the Gunnison from several trail access points in the Black Canyon, including the Chukar, Bobcat, Duncan and Ute trails, as well as the lower river from the Gunnison forks. 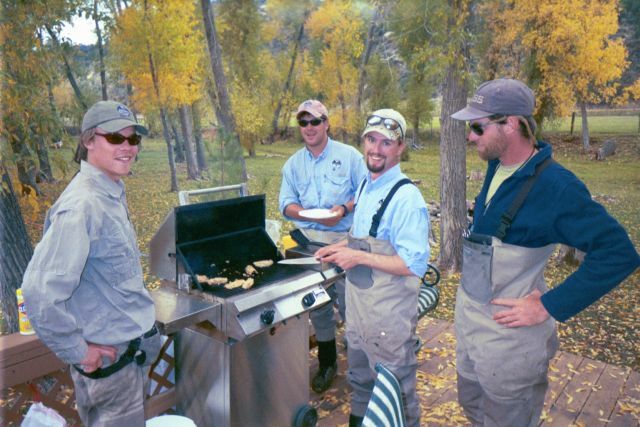 1-day float fishing trips are available on the lower stretch, beginning at the forks and fishing six miles downstream to Gunnison River Farms. Private water provides the opportunity to pursue trophy trout in unique solitude. Telluride Angler has many miles of exclusive guiding access on the Dolores and Uncompahgre rivers, plus terrific lake fishing at Gurley Reservoir and intimate small stream water on the grounds of Dunton Hot Springs. Please CLICK HERE to review our "Private Water Menu." Coming to ski? Bring your fly rod! Winter fly fishing in Telluride is one of the best-kept secrets in Colorado. Everyone needs a day off from the slopes, and you'll find excellent winter fly fishing on both the Uncompahgre and San Miguel Rivers. We have guides available every day during the winter, with quality public water and tremendous private water alternatives. Top quality rental equipment is available, so don't worry about packing for two sports. The San Miguel is normally excellent from late February through April, while the Uncompahgre fishes well in all of the winter months. Private water is available on the Uncompahgre, adding the dimension for a multi-day winter fly fishing experience. You'll be pleasantly surprised. Winter is a beautiful season on our rivers.